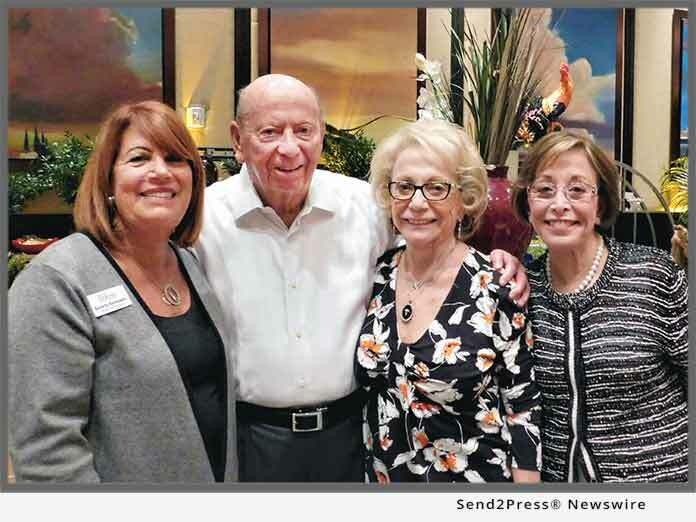 BOCA RATON, Fla., Oct. 23, 2018 (SEND2PRESS NEWSWIRE) — The Pap Corps Champions for Cancer Research has announced a $100,000 matching gift challenge by The Yass Family. This gift will be utilized to enhance the 2018 Dr. Kevin Berkowitz Memorial End of Year Giving Campaign, which will be directed towards melanoma research at Sylvester Comprehensive Cancer Center at the University of Miami Miller School of Medicine. Jerry Yass made this generous gift during the recent Pap Corps Presidents’ Meeting at Boca West Country Club in honor of his late wife, Sybil, who died in 2001 from melanoma. Jerry Yass, an active member of the Boca Friends Chapter of The Pap Corps, moved the audience of over 400 during his emotional speech at the Presidents’ Meeting when he read a poem he wrote about the challenges a family endures when a loved one is battling melanoma. During the past 30 years melanoma rates have been on the rise. In 2018, it is estimated that 91,270 people will be diagnosed with melanoma, and that 9,320 will die from this form of skin cancer. Early detection and advanced treatments are critical to increasing survival rates. Sylvester offers a world-class melanoma surveillance and detection clinic, immunotherapy clinical trials, advanced expertise in immunohistochemistry and tumor markers. In addition, Sylvester is one of the few institutions to offer reflectance confocal microscopy (RCM) which differentiates melanoma from less serious skin lesions. Dr. Kevin Berkowitz, a generous supporter of The Pap Corps, established the first end of year matching campaign in 2014 and it now continues in his memory. Since its founding in 1952, The Pap Corps has donated more than $110 million to Sylvester Comprehensive Cancer Center at the University of Miami Miller School of Medicine, including a historic $50 million pledge in 2016 dedicating The Pap Corps Campus at Sylvester in Deerfield Beach. The Pap Corps derives its name from Dr. George Papanicolaou, a pioneer in cytopathology and early cancer detection, who introduced the world to the revolutionary ‘Pap’ test. A small group of women began the organization to support his efforts, and over the decades it has grown into an organization of over 20,000 men and women, in over 50 chapters, who raise funds to support all types of cancers. For more information about the organization’s history, fundraising initiatives and volunteer opportunities, please visit http://thepapcorps.org/. *Web photo caption: Pictured: Beverly Berkowitz (Pap Corps VP), Jerry Yass, Helen Mofitch, Linda Moses (Pap Corps President). "We are tremendously grateful to Jerry Yass and his family for making this matching gift to us," said The Pap Corps' CEO David Bakelman. The Pap Corps, Champions for Cancer Research is one of the largest all-volunteer fundraising organizations in South Florida. More than 50 chapters and 21,000 members are dedicated to supporting research for all types of cancer at Sylvester Comprehensive Cancer Center, the only academic hospital in our community. Since 1952, The Pap Corps donated more than $50 million dollars to achieve our vision because Research Matters.